Okay. You don't know how much wrath I've endured with merely reporting that this story was developing in its third phase. I can't relate to the runner nor can I relate to poor Principal Marbury. I'm not comparing my stress to theirs, but I'm beginning to understand. Most of you cached the original post and others have labeled me a coward for pulling it down, but let me catch you up with things. For the bulletin board anonymous, I do know the difference between principle and Principal and unless I'm drinking wine, I know how to spell both. First off, I make like 72 cents a month off my blog so you kind of get what you pay for. Yes, the internet jumps to conclusions, but so did Frank Reynolds on ABC when Reagan got shot and didn't have all the facts compiled and he didn't have social networking. Yes, I'm that old, and no, I'm not Frank Reynolds. What I do know is I've been dragged into this mess as I've become associated as the blogger that "broke the story." Um, no. I did not break the story. The bulletin boards were lit up like Clark Griswold's Christmas tree as it became a story about the validity of the original BQ. Supposed facts started piling in including photos and previous Athlinks race results. 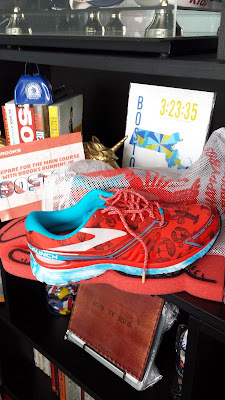 "I'll interject here that if...(he) ran a 3:11, I'll send him a commemorative pair of Brooks 2015 Boston Marathon "laaabstah" shoes (size 11.5) along with a SeekingBostonMarathon.com sticker." I also offered a YouTube apology if this is all a big misunderstanding. Those offers still stand. I'll offer the written version early as this spun far out of control. I wrote about the woman who kissed the man in Wellesley and tried to track him down to find out he was married. His wife was a good sport at least in the press, but rumors are he's sleeping at his bowling buddy's house (note the sarcasm.) I also wrote about the gentleman who was the last finisher of the Boston Marathon who suffers from a muscular condition, Maickel Melamed. No one picked up either story with the fervor as this one. Maickel deserves a lot more ink than this one that should simply fade away. There are questions that remain unasked, but I'm not the one to ask them since Lehigh will and others far more qualified than I will ask them. Perhaps I crossed a line with my Cheech and Chong reference, but you should have known better after my "Fifty Shades of Marathon Grey" or "Why Triathlons Are Like Frat Houses" posts to consider the tone and accuracy of this 72 cent a month blogger. 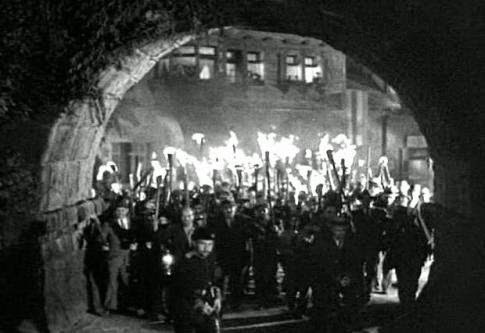 Sorry to any I've hurt or offended, but I will continue to write about the Boston Marathon all year long. It's my passion and I could not resist writing about this story the first time, and hoping it will be the last. Move over Rosie Ruiz, you may have some competition from Mike Rossi. At least that's if you believe the runner bulletin board material. There are some fantastic stories that came out of the 2015 Boston Marathon including Maickel Melamed from Venezuela who was the last one to complete the race in 20 hours suffering from a rare muscular condition. Then there's Mike Rossi. 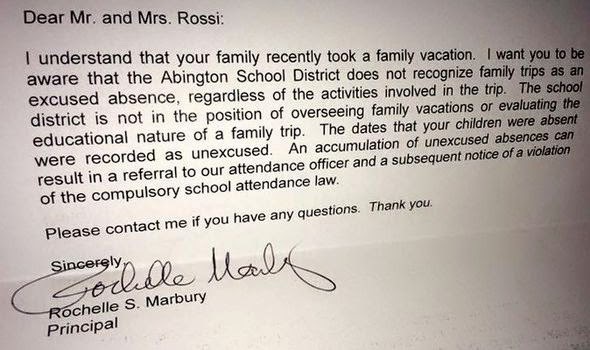 Mike got his 15 minutes of fame by writing a letter to his children's high school principal in response to the letter he received from their Principal (left) regarding their "unexcused absences" due to attending dad's race at the 2015 Boston Marathon. "they learned about dedication, commitment, love...overcoming adversity"
"they watched their father overcome injury, bad weather...and many other obstacles...to achieve a personal goal." Heartbreaking, passionate, I nearly formed a lump in my throat, and started to "tear up" (#Sarcasm). I also took my high school senior out of school for a once-in-a-lifetime experience to see me race in Boston. 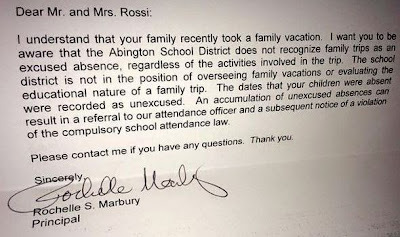 His absences were unexcused (since Dad neglected to call until we were in Boston.) I felt the same way as Mike about pulling my son out of school. My story didn't go viral, nor did I go on television to defend my honor. Mine was a non-story as Mike's should have been. I too overcame injury, and felt fortunate to be at my fifth Boston Marathon. People came out of the woodwork to defend this guy's position and how could the principal dare question the kids trip. The first curve in the story is that it sounds like the letter was merely a template sent out in these situations, not the cold, callous, and heartless letter that social media first made it out to be. Principal Rochelle Marbury's name and motivations were called into question and became vilified in the social media world prompting his son to post to Facebook with a "stop the madness" plea. Rochelle received hundreds of scathing emails, prank phone calls which brought tears to the woman who dedicated her life to education. Viral story part II. Just when we thought this was a big misunderstanding blown way out of proportion, people started to look at bit closer at how Mike got to Boston in the first place. It seems that Mike has only been running for 27 months, and is a 47 year-old that ran a sizzling 3:11 at the Lehigh Valley Health Marathon in 2014. Impressive. Or was it? Conspiracy theorists start by pointing out that the race photo site only shows one photo of Mike...crossing the finish line. There were no timing mats throughout the course; just start and finish. 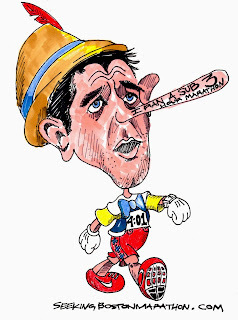 This is starting to sound like Paul Ryan (POST HERE); the politician who claimed a sub three hour marathon. I'll interject here that if Mike legitimately ran a 3:11, I'll send him a commemorative pair of Brooks 2015 Boston Marathon "laaabstah" shoes (size 11.5) along with a SeekingBostonMarathon.com sticker. Why do runners "smell blood in the water" and want answers? 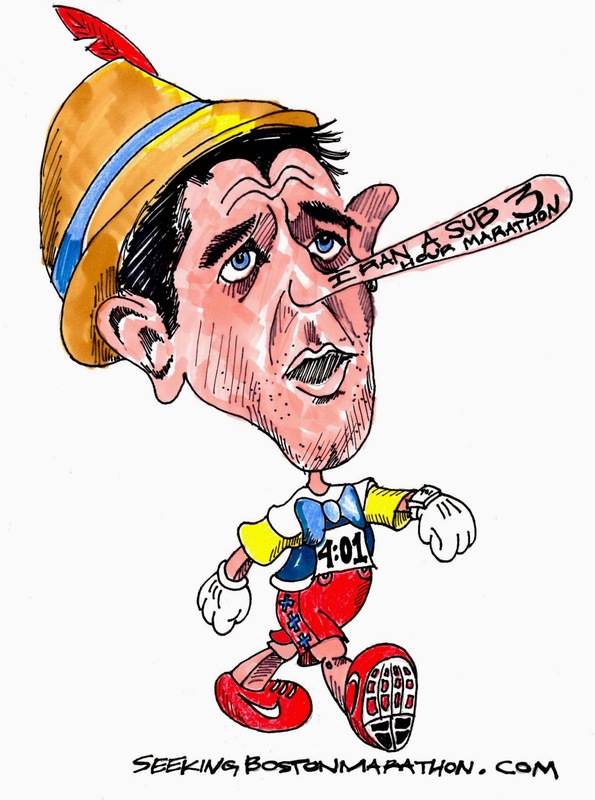 It also seems that none of Mike's previous races (5K and up) have any indication that he was capable of running a 3:11. He ran a 4:01 in Boston (due to injury,) and a 3:43 in the Philly Marathon which is more in line with his Athlinks previous race results. A 3:11 marathon is a 7:19 pace. Less than two months earlier, he ran a similar pace (7:13)...in a 5k. If he can maintain the same pace in a marathon that he has in a 5k, I'll eat my run hat, and issue a public apology on my YouTube. Speaking of YouTube, he posted his 2015 Boston Marathon race recap on YouTube (I can't knock that as a blogger who's done it before) but it fundamentally comes across as some sappy shoe commercial about running or some guy that crawled out of a hospital bed (oh wait, that's my story,) to race Boston...or that he actually won the darn thing. He shut his blog down to invite only (what blogger would do such a thing?,) still has his twitter account, and the bulletin boards (like LetsRun.com and Runner's World) are lighting up over this. Just like the wrath poor principal Marbury received, Mike is now on the receiving end. Demands for answers; photos on the Lehigh course, his Garmin file from Lehigh, or even a long run prior to Lehigh that resembled anything close to this amazing leap in performance have gone unanswered as far as I know. I can get over the t-shirts idolizing Dad and Mike for running Boston...I see lot's of families that do that for a runner, but the YouTube video makes him look like a narcissist jerk. There was no story in the video (other than he ran Boston) but I'm afraid he's got a real story now. I will quote the wise prophets Cheech and Chong, if it "looks like dogshit, smells like dogshit...must be dogshit." Or...I owe Mike a pair of Brooks. Bravo, Ty! This guy is not a 3:11 marathoner, and he knows it. Sad that he had to take someone else's spot in Boston, and made such a gong show out of it. I hope the truth will come out sooner than later. Ty - I have some information related to this. Let's connect via email. 3:11 looks so easy on him, no sweat on his clothes, his hat looks dry, socks in perfect position.. "Never let them see you sweat" doesn't really apply to a marathon PR finish line photo. Whoa, I didn't realize this was getting out of hand! I found the shaming of this principal unfounded and this guy still can't apologize for his actions. He originally posted in a facebook group I belong to. 4:01 "due to injury" - injury, riiiiggghhht. Posers/cheaters like this guy and Kip Litton belittle the achievements of all of us that work so hard to legitimately qualify for and run the Boston marathon. Once somebody compiles definitive proof that this guy cheated, please submit the facts to the BAA. Oooohhhhh !!!! Did not hear of this part. And as a matter - I don't approve of him publishing the letter like that on media (although he probably had no idea that it would go viral like that). The teachers and educators have a tough job as it is. What harm did the letter do? It is standard policy and I got one like that when I took my kids out for my first marathon and another one saying Social Services would be informed after a similar absence for hubby's first marathon the month after. My kid was in kindergarten. And the teachers and principal knew where and why my kid was gone. But the letter still had to be sent and it was. For what it's worth, I did not feel you were out of line with your earlier post, but I appreciate that you didn't want to upset his kids and therefore took it down. As a fellow runner, I applaud you for your prior post. I thought the Cheech and Chong reference was hilarious and used in the right context given the facts and circumstances. And as a practicing attorney, I do not believe that Mike Rossi has any valid legal claim against you for libel. Should I be upset for the fact you deleted my comment? Just imagine if in this year race someone pulls a r0$$1 and blast an American or WR!! !